Can the Ricoh Aficio MP161LN copier be powered by a power inverter? Which specific power inverter should I use? We don't sell power suppy units for printers. Please contact Ricoh directly to speak to their technical support team. Alternatively, you could try a local printer hardware supplier. The Ricoh Aficio MP161LN is a fully networkable printer, scanner, and copier, ideal for workgroup use. It is a highly reliable device that offers standard duplexing, user-friendly operation, and versatile paper handling. The Ricoh Aficio MP161LN multifunction printer is also a cost-effective solution for increasing productivity and optimising office workflow. 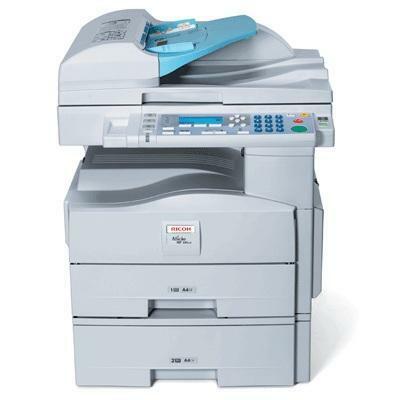 However, the Aficio MP161LN copier can only print up to 16 pages per minute, which is quite slow for a laser device. The Ricoh Aficio MP161LN printer measures only about 19x17x14 inches, compact enough even for offices with small work spaces. It is equipped with a digital scanner and copier, offering a maximum resolution of 600 dpi. The Ricoh Aficio MP161LN monochrome copier has large capacity paper trays, with a 50 sheet bypass tray that can handle different sheet sizes. The device connects via USB and AppleTalk and IPX/SPX protocols, which allows convenient networking. The genuine black toner cartridge compatible with the Ricoh Aficio MP161LN printer has an estimated yield of 7,000 pages. The Ricoh Aficio MP161LN mono laser printer doesn't require long warm up times, ready to print / scan / copy in as little as 10 seconds. It offers automatic duplexing as well as automatic copy reduction and enlargement. The Ricoh MP 161LN has a user-friendly configuration, making it suitable even for non-tech-savvy work groups. With its flexible document handling options, the Aficio MP-161LN mono multifunction printer is a great solution for improving the workgroup's workflow. Speed is not the best asset of the Ricoh Aficio MP161LN copier. The Aficio MP 161LN laser printer can only print at a slow rate of 16 ppm, and only handles black and white printing and coping. Scanning, however, can be done in full colour.